The 2013 census for the Republic of Albania gives a total population of 2.774 million. In 1991 it was 3.256 million. The Albanian language is known as shqip. The variants of spoken Albanian between the Ghegs in the north and the Tosks in the south are so significant that a standard literary language, gjuha letrare, was agreed in 1972 and is used in all education and publications. 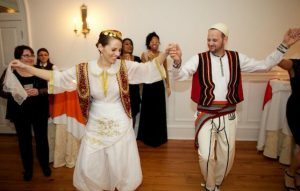 Albanian’s trace their history back to the ancient Illyrians who were later joined by neighbouring Greeks until the Romans arrived in the second century BC and assumed control for six centuries until the Byzantines took control. The Albanians fought for independence in the md-fifteenth century, but became part of the Ottoman empire for more than four centuries. Following the establishment of the nationalist Albanian League and uprisings in 1910 and 1912, the Turks finally gave Albania autonomy. Establishing a coherent state proved difficult and WWI saw the country occupied by a succession of armies. In 1941, Enver Hoxha formed the Albanian Communist Party and became leader of the country from 1945 until the early 1990s. 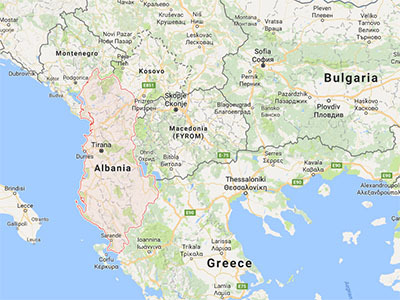 In 1978 China broke their partnership, leaving Albania extremely isolated. Albanian customary or traditional law governs social behaviour and almost every facet of life in rural Albania today. In its definitive form, the ancient code of the Kanun of Lekë Dukagjini was able to preserve Albanian identity, autonomy and way of life under the Ottoman Empire for five centuries. Modern Albania is an extremely secular society. In 1967, all religious communities were dissolved when a communist government edict banned the public practice of religion. The law was rescinded in 1990 during the collapse of the regime. The national and ethnic symbol of Albanians is the eagle. The national hero, Scanderbeg (1405–1468), used an eagle on his flag and seal as did the nationalist movement as a symbol of resistance to the Ottoman Empire and freedom fighters seeking autonomy and independence. 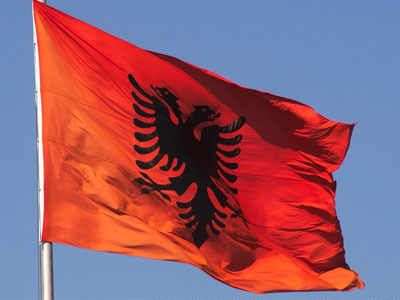 In 1912, the flag bearing a black double-headed eagle on a red background became the official flag of Albania. The traditional architecture of Albania almost disappeared between 1944– 1990. The old towns and bazaars of Tirana and many other urban centres were demolished and replaced by socialist symbols and uniform housing blocks. Between 1966 and early 1974, virtually all the churches and mosques were razed or transformed beyond recognition. Berat and Gjirokastër, still remain and are declared museum cities, otherwise little of the traditional flavour of Albanian towns exists. Despite their poverty, Albanians are exceptionally generous and hospitable. Weddings usually involve copious amounts of meat, washed down with Albanian raki, an alcoholic beverage. Animals may be slaughtered and roasted on a spit for public holidays. The annual spring festival is marked with the baking of a sweet cake known as ballakum Elbasani. Orthodox Albanian’s eat qumështor, a custard dish before the start of Lent. The pre-war persecution of intellectuals and the break with virtually all cultural traditions created a literary and musical vacuum that lasted until the 1960s. The writer and poet Ismail Kadare (b. 1936) is probably the only Albanian writer with a broad international reputation.